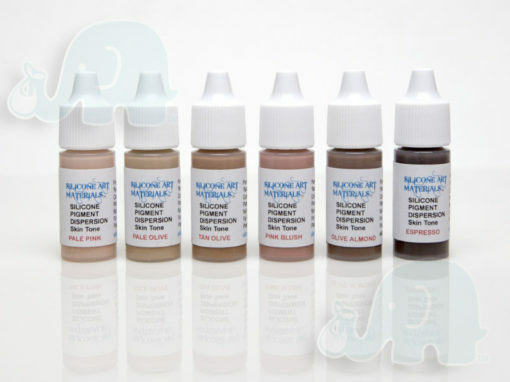 These gorgeous liquid silicone pigments offer an amazing neutral base for your silicone babies. Use it in your favorite platinum silicone base as paint OR use it to pigment your platinum silicone! Dispersed in a “reactive” silicone fluid- it cross links with the platinum silicone matrix binding with your choice of platinum silicone. Can be used as silicone pigment for all platinum silicone (Dragonskin, Ecoflex) intrinsically pigmenting silicone OR extrinsically mix with your choice of silicone (dragon skin, Psychopaint, Ecoflex, RTV silicone) to use as silicone paint. Can be mixed into your custom shades for painting or pigmenting biracial/Hispanic/Asian/African American skintones.